As some new users may know, STEEMIT requires email and phone verification to sign up now. This is a significant barrier to entry for some people, as not everyone has or wants a mobile phone, nor do they feel comfortable giving out their email address. Enter in the username you want, and select your payment method. Either Bitcoin (BTC), or Litecoin (LTC). If you don't have any Bitcoin, be aware they are the most popular cryptocurrency, and are easy to buy in most countries. Send the Bitcoin or Litecoin amount to the address shown. There is also a QR code on the screen incase you use a mobile wallet such as Copay or Mycellium. Disclaimer: The account in the screenshot does not actually exist. The password there will not help you. 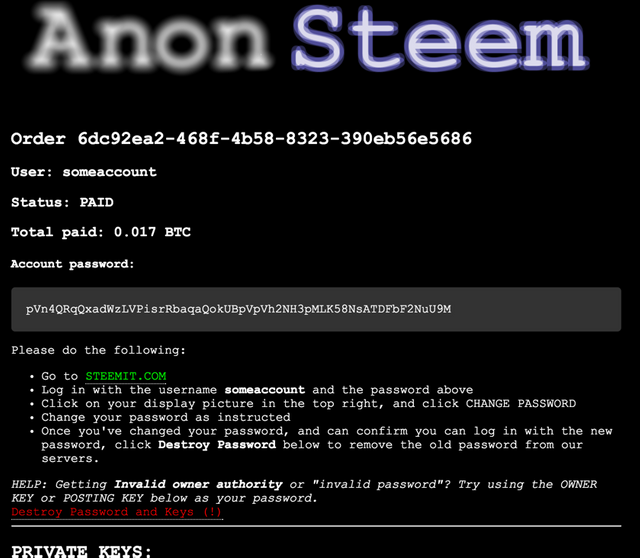 Within 60 seconds, AnonSteem will process your payment, and your account will be created. The page will automatically refresh, and you'll see your account password and keys, with instructions on changing them if you're concerned about the safety of our generated passwords. 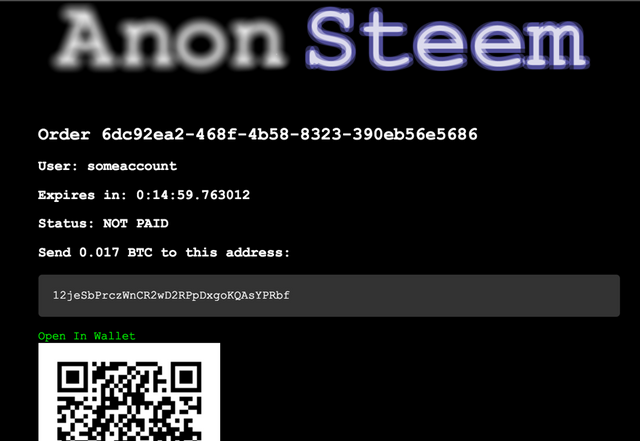 This article was written by ANONSTEEM owner, @someguy123 - Do you like what I'm doing for STEEM/Steemit? Vote for @someguy123 to be a witness - every vote counts. Don't forget to follow @anonsteem and @someguy123 for more like this. Can vouche for this service. Not only is it fast and reliable but @someguy123 is extremely helpful and offers support along all steps of the way. Great asset to our community. 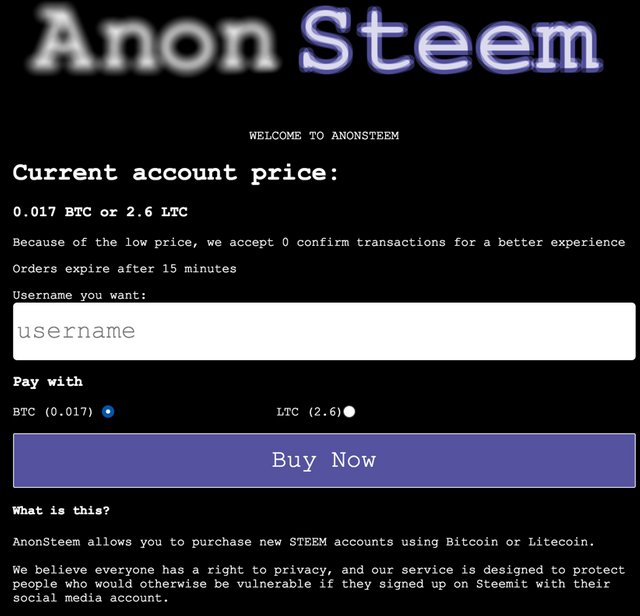 Happy customer, I'm one of the over 200 anonsteem has created and can vouch - simple, inexpensive, honest and straightforward. You can add my name to the list. I've used it to create many accounts for me and my friends, including @the.masses account. It is a great service and I do recommend it, but the fees are a little high. 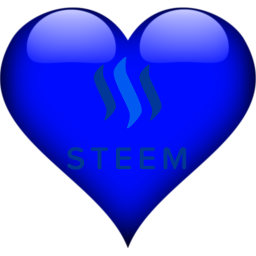 If you already have a Steemit account, there is another service called SteemConnect which allows you to create the account yourself, and is cheaper.